Venoclaw is an unreleased treasure-chest like Bakugan. It appeared in episode 8 under the ownership of Taylor. Venoclaw used the ability Dark Silencer on a Haos Jetro to destroy the enemy Bakugan of Emperor Barodius' army. Later, it battled against Helix Dragonoid and Hawktor alongside Avior. It lost the battle and was taken by Dan, which brought Taylor out of the spell. In a way of the shape, it represents Scorpion. It has a jeweled design similar to that of El Condor. Aquos Venoclaw has 860 Gs, Haos Venoclaw has 870 Gs and Pyrus has 850 Gs . It will be released in wave a.k.a in November/December. 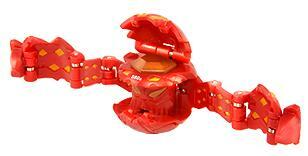 Purchase your Venoclaw Bakugan from Amazon now!